Manchester Oxfam. A surprising £1.99 in a shop where most of the records seem over-priced. There are so many things wrong with this sleeve. The song, as you can see, is ‘Pretty Woman’ but the image suggests that maybe it should be ‘Pretty Boy’…or, at a pinch, ‘Pretty Women’. The woman on the right is directing that side-long glance at…who? What’s happening? They don’t look like people who would knock over a jukebox and then use it as a kind chaise longue. What kind of mess have they made of the 45s inside that jukebox? (Someone out there knows what model that jukebox is) Maybe they were upset that Roy Orbison (Roy Orbison and the Candy Men on the record) is not ‘Artist of the Week’. 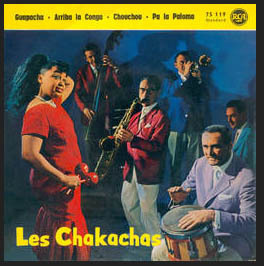 In fact the Artist of the Week’ is (are) ‘Les Chakachas…a Belgian Latin band who had their biggest hit in 1972 with a disco number ‘Jungle Fever. But that is to skip ahead…another time…another place. So who are these people on the cover? Is this a German love triangle or a Belgian anti-tango squad. 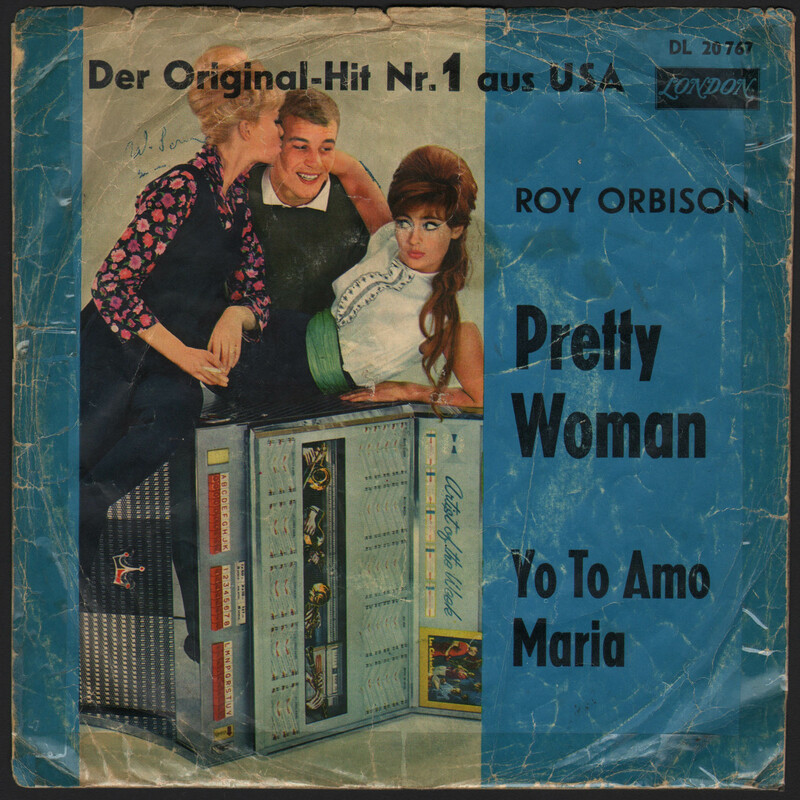 Is it just a coincidence that the b-side of ‘Pretty Woman’, ‘Yo To Amo Maria’ features heavy Spanish guitars and a chorus that (web) translates as ‘I to love Maria’. We may never know. Here is The Big O on Top of the Pops. Here is one of those great lo-fi youtube videos showing a record going round. And here is some other smutty piece of disco foolishness from Les Chakachas…just a still of a record sleeve this time. I looked for some live footage of Les Chakachas but somewhere down the line I realized that life is too short. This notwithstanding, the young man’s uncanny resemblance to (pre Falklands and Koo Stark,) Prince Andrew – who was even then, very clearly limbering up for a 2-4 the price of 1 birds scenario: eg Fergie…I think the very moody composition and dodgy coloration betrays a more likely intent to convey a clear sense of a serious shagathon… Rather than an iconicist’s desire to destroy a Roy Orbison meisterwork…? Heterotopic mallaise… Surely an oxymoronic description: heterotopic reverie mare like…? Anyway leaving the quasi phenomenology to one side; is there anything gaed on the telly now that Rebus is finished…?? ?